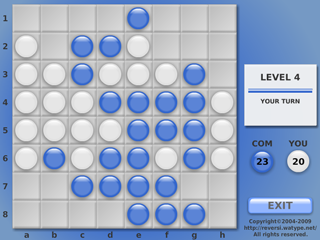 *The game, reversi.watype.net is provided on "as is" basis without express or implied warranty of any kind. *The latest version of Adobe Flash Player is required to play the game. Adobe, Flash and ActionScript are either registered trademarks or trademarks of Adobe Systems Incorporated in the United States and/or other countries.